!! OMG, what a SCHOCKER! Anti-LGBTQ former congressman Aaron Schock seen partying shirtless and getting horny with men at Coachella !! 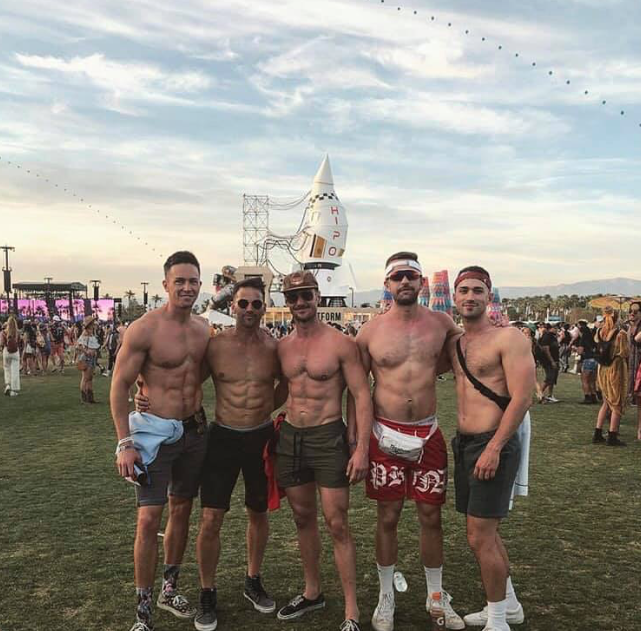 Aaron Schock, the former GOP congressman from Illinois (who is infamous for his anti-gay voting record and alleged misuse of federal money) was seen partying shirtless witha bunch of gay men at Coachella and with his hands down another man’s pants while making out with him – in public! The GALL of it all! Schock, who represented Illinois’ 18th District, resigned in March 2015 after he was accused of using campaign funds and office accounts to pay for lavish trips and events. He has been criticized by gay activists for voting against the repeal of “Don’t Ask, Don’t Tell” and against amending federal hate crimes laws to include crimes where the victims were targeted on the basis of sexual orientation, gender identity, gender and disability. Thanks for all you did to oppress LGBTQ Americans, Aaron! Now go enjoy the community, take that ecstasy and get that Coachella D! Check out Aaron getting hot and heavy with another gentleman after the jump! We can see why gay Twitter has been outraged. !! OMG, Mike Pence reacts to remarks from Pete Buttigieg about his anti-LGBTQ views: ‘He knows better’ !! CNBC’s Joe Kernen discusses Vice President Mike Pence‘s back-and-forth with Pete Buttigieg, the out-and-proud mayor of South Bend, Indiana who is trying to make his mark in the crowded field of Democratic primary contenders. Pence stands firm on his anti-gay views. !! OMG, Vic Berger presents: Joe Biden promises to be less handsy !! It seems Joe Biden loves a good hair sniff! Check out Vic Berger giving good ole’ Joe the Vic treatment above! !! OMG, WATCH: Trump says windmills cause cancer and kills bald eagles !! This is absolutely NUTS! And he’s still obsessing about Hilary Clinton? Check out Trump‘s garbage spew at the Republican committee dinner. He’s so environmentally conscious! !! OMG, WATCH: Trump talks at reporters and shows reporters a map !! The perfect way to start your week! Learn something new above with Trumpy-Poo! !! OMG, WATCH: I  MY second grader president !! Cool story, bro! Check out Vic Berger‘s ‘I  MY second grader president’ above! !! OMG, WATCH: Tucker Carlson explodes at Media Matters after they expose his misogyny, racism, and homophobia !! Tucker Carlson blasted Media Matters on his show Tuesday night after the watchdog organization exposed his past misogynistic, racist, homophobic remarks in a set of videos. Some advertisers have since begun pulling out of his show.